Discover the dermatology developed skin care collections recommended and highly regarded by skin care experts around the world. We are proud to partner with NeoStrata and supply their skin care products at SkinMiles. 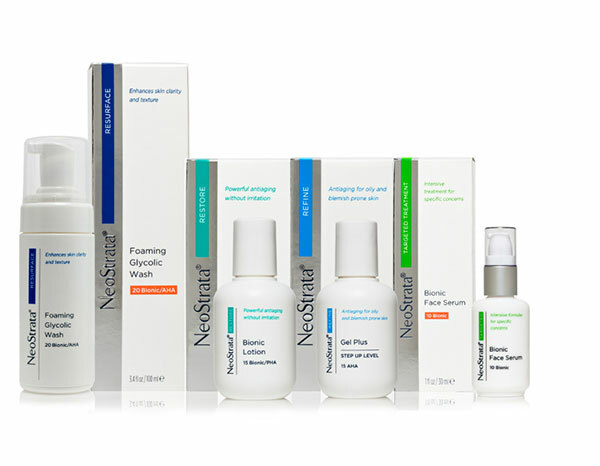 NeoStrata Company, Inc. located in Princeton, NJ, develops and markets a comprehensive range of clinically-proven, dermatologist developed skin care brands including NeoStrata, Exuviance, CoverBlend and Psorent. NeoStrata’s advanced therapeutic and cosmetic dermatological products feature unsurpassed Polyhydroxy Acid technology to meet the needs of every skin type and are available worldwide through consumer outlets, physicians’ offices and spas. NeoStrata, a leader in scientifically-advanced, cosmetic dermatology, develops products recommended by doctors and skincare experts worldwide that visibly resurface, restore, rejuvenate, enlighten and refine skin. Dr. Eugene Van Scott and Dr. Ruey Yu, NeoStrata’s co-founders, first revolutionised anti-ageing skincare with the discovery of the rejuvenating powers of Alpha Hydroxy Acids and, later, Polyhydroxy Acids, Bionic Acids and N-Acetyl Amino Sugars/Acids. Together they created the original patented glycolic acid peel. The positive effects of their anti-ageing discoveries have been documented in scientific journals and forums around the globe. Today, the revolution continues with the discovery of breakthrough Aminofil, a novel technology designed to target deeper lines and wrinkles. NeoStrata products are formulated in our labs with technologies and ingredients that are patented, proprietary and globally sourced to deliver visible results for a variety of skin types and conditions including photo-ageing, rosacea, hyperpigmentation, severe dryness and acne. Advance to healthy, radiant skin with the science of NeoStrata. Alpha Hydroxy Acids Glycolic Acid, a natural constituent of sugar cane, exfoliates the skin by enhancing cell turnover, evens the distribution of pigmentation, refines the appearance of pore size and helps smooth the look of fine lines and wrinkles. Our Glycolic Acid products deliver optimal efficacy at an ideal pH and concentration. Amphoteric formulations are designed to minimise redness and irritation potential. Citric Acid, found naturally in citrus fruits, is a powerful Alpha/Beta Hydroxy Acid that has preventative antioxidant and corrective anti-ageing effects, helping to reduce signs of photodamage. Because it has both preventative antioxidant and corrective anti-ageing effects, it is often used to target specific skin concerns. Gluconolactone, a PHA found naturally in the skin, provides full strength anti-ageing benefits without irritation, even for patients with clinically sensitive skin or rosacea, or those who have had cosmetic procedures. Gluconolactone strengthens the skin’s barrier function, reducing sensitivity to irritants and skin redness over time. It helps preserve skin’s collagen by reducing glycation. Gluconolactone does not increase the potential for sun sensitivity. Lactobionic Acid, a patented non-irritating “Bionic” PHA derived from milk sugar, helps prevent and reverse the appearance of photo-ageing, including fine lines and wrinkles, uneven pigmentation, enlarged pores and roughness. A potent antioxidant used to prevent oxidative damage to transplant organs, Lactobionic Acid promotes firmness by inhibiting the MMP enzyme responsible for degradation of collagen and consequent wrinkling and skin laxity. A natural humectant, it binds water to create a moisturising barrier on skin. NeoGlucosamine, is a patented non-acid amino sugar technology that gently exfoliates the skin to promote cellular turnover, diminishes fine lines and wrinkles, and exfoliates hyperpigmented spots and acne for a more even skin tone. Aminofil, is a revolutionary, patented amino acid derivative that builds skin’s natural volume and visibly reduces the appearance of deep lines and wrinkles, such as scowl lines, furrows, crow’s feet and smile lines, resulting from UV induced photodamage and repetitive facial expressions.